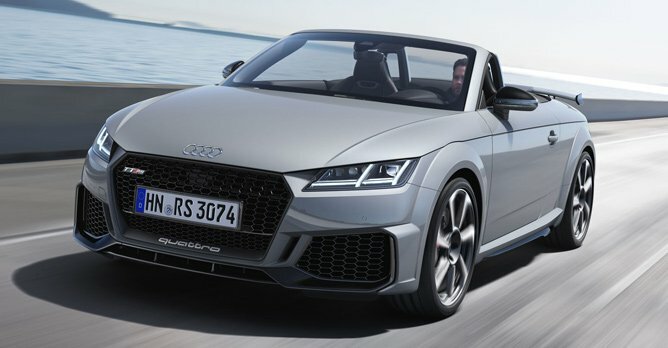 Audi has updated the TT RS, retaining its unique five-cylinder powerplant while gaining subtle but effective styling tweaks. Audi has unveiled the updated Audi TT RS, with subtle but effective styling tweaks. The redrawn front end and the striking rear give it a dynamic appearance. The quattro logo in a matte titanium-look is positioned in the lower section of the gloss black grill with its matte black singleframe. Lateral air inlets, which have been enlarged once again, are each divided by vertical strips on the inside and outside and extend almost all the way to the front wheel wells, making the new TT RS appear extremely wide. A continuous front spoiler drawn up steeply at each side pulls the front apron down sharply, giving the car its distinctive, motorsport-inspired look. At the rear, a newly designed fixed rear wing with side winglets catches the eye. As part of the aerodynamics concept, it supports RS-typical performance and efficiency. There are vertical design elements on both sides above the new RS-specific diffuser. Two large oval exhaust tailpipes create the signature RS finish. Its famously charismatic beating heart remains. The 2.5-litre, five-cylinder powerplant delivers 394bhp and 480Nm of torque, enabling a sprint time of just 3.7 seconds to 100km/h and up to 280km/h at the limit. For cooling purposes there are additional radiators located behind the typical RS honeycomb grill. The new TT RS is available in eight different colours, including the new RS-specific colour Kyalami green and the new colours Pulse orange and Turbo blue. Upon request, the matte aluminium and styling package highlights the blade and rear wing. The fabric top of the TT RS Roadster is black, and privacy glass is fitted to the coupe as part of the standard equipment list.